Big opportunity guys! 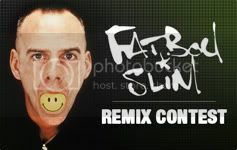 Beatport is launching the Fatboy Slim remix contest! Download now the parts and begin to play with “Weapon of Choice“, one of the best track of the master! Some cool prizes are waiting for you: a release on Skint Records, $200 Beatport gift card and the amazing DBeat by Open Labs! Skint Records and English DJ and record producer Norman Cook, better known as Fatboy Slim , are offering his ‘Weapon Of Choice’ track to be remixed by Beatport’s aspiring producers. ‘Weapon Of Choice’ saw success on both UK and US charts and its accompanying music video, directed by Spike Jonze and featuring Christopher Walken, received cult-like praise. Now is your chance to put your spin on the infamous track. The winning remix will be released on Fatboy Slim’s Skint Records as well as receive free music downloads from Beatport and Open Lab’s professional studio tool ‘DBeat’, a grand prize package worth over $4000. Starting March 16th, 2010, Beatport users are able to download the remix parts of Fatboy Slim’s ‘Weapon Of Choice’, and then remix it, before uploading it to Beatportal for the voting round. The winners will be divided into 2 categories; 10 user voted (based on the highest number of spins) and 10 editor’s favorites (picked by Beatport’s internal music staff). From these 20 nominees, Skint Records will choose their favorite winning remix, to be released on their label. The winner will also receive a $200 Beatport gift card and Open Lab’s professional studio tool ‘DBeat’.